This replacement for the Panasonic P-01H-F2G1 battery (aka: 2-1/3AA-C battery) puts out 2.41 volts at 110mAh. Guaranteed to be a dependable choice for your Panasonic P-01H-F2G1 Cordless Telephone, it is designed and built to meet or exceed the original battery's specs at a much better price. looking for powerful cordless phone batteries? then look no further than the panasonic p-01h-f2g1 replacement battery. from high-quality components to high-tech manufacturing processes, panasonic delivers on its promise of a quality, lasting p-01h-f2g1. on top of that this battery is developed to match or beat the requirements set forth by the manufacturer. 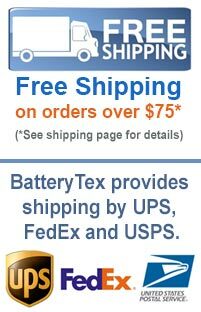 with a massive inventory and everyday low prices it's easy to see why batterytex.com is your go-to site for replacement batteries. thank you for making batterytex your provider of replacement batteries at everyday low prices. want more information or bulk discounts? call us now at 1-888-825-6661. save on other cordless phone batteries batteries - search our wide inventory here. to see our full inventory of batteries from this manufacturer click here. today's batteries go above and beyond featuring greater technology, manufacturing and materials while decreasing their cost. if you want to find the warranty information and timing on a particular battery please contact us.